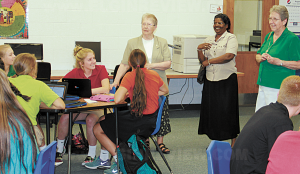 Pictured l-r: Sister Patricia Hoffman, Sister Francitta Pazhukkathara and Sister Mary Diez visit students in the library. As Pope John XXIII Central Catholic High School enters a year-long celebration of its 50th year, past students, faculty and staff are welcome to visit the school. This past week, Sister Mary Diez walked the halls of Pope John once again. She taught high school English, Humanities, French, and Religion to many of the 200 students enrolled in Pope John from 1970-1976 and was part of the Administrative Team from 1973-75. Sister Mary was also an advisor for the school paper and speech team. After spending part of her childhood in the Niobrara and Creighton, Nebraska area, Sister Mary joined the School Sisters of St. Francis in the 1960’s and graduated from Alverno College in Milwaukee, Wisconsin in 1967. She currently serves as a member of the International Leadership Team for the School Sisters of St. Francis (SSSF), which is a an international community of Catholic sisters. Sister Mary spends about four months out of the year visiting the areas around the world where the School Sisters organization has 750 nuns in service. Sister Pat Hoffman, math instructor at Pope John is one such nun. She has been serving the school since 1972. Sister Mary and her fellow Leadership Team Member, Sister Francitta Pazhukkathara, received a tour of the school. “Bringing in St. Boniface School is such a good use of the building and is a good connection to make between high school students and the elementary students,” stated Sister Mary. She was also impressed with the condition of the facilities, “It has really been kept up nice and updated, ” she commented. When asked for her final thoughts about Pope John High School, she said, ” There is such a strong spirit in this school, it was that way when I served here and it is still here today.” After taking a brief stop back home in Milwaukee, Sister Mary is headed to visit a SSSF province in India.